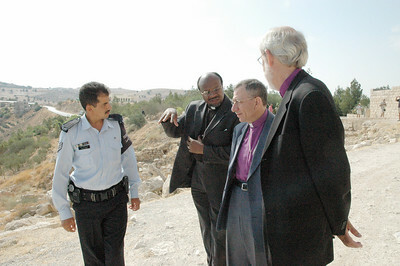 Bishop Mark Hanson, right, ELCA presiding bishop and Lutheran World Federation (LWF) president joined Bishop Munib Younan, Evangelical Lutheran Church in Jordan and the Holy Land and LWF vice president, second from right, and LWF General Secretary Dr. Ishmael Noko, in a tour of Mr. Nebo in Jordan. In the Bible Mt. Nebo is named as the place of Moses death. A memorial to Moses has been excavated. With the three LWF leaders is a tour guide, left. 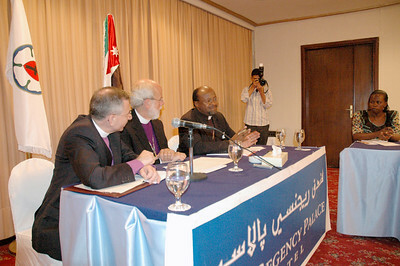 Bishop Mark Hanson, ELCA presiding bishop and Lutheran World Federation president, center, responds to questions at a news conference Aug. 27 in Amman, Jordan. With Hanson are, left, Bishop Munib Younan, Evangelical Lutheran Church in Jordan and the Holy Land and LWF vice president, and right, LWF General Secretary Dr. Ishmael Noko. The three visited Jordan prior to the LWF Council meeting in Bethlehem, West Bank, Aug. 31-Sept. 6. 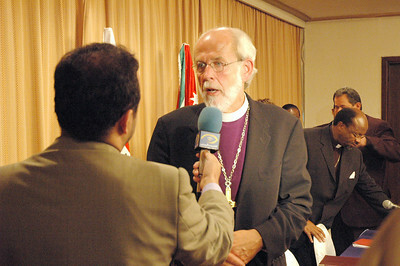 Bishop Mark Hanson, ELCA presiding bishop and Lutheran World Federation president, responds to questions from a reporter with Jordanian Television following a news conference Aug. 27 in Amman, Jordan. 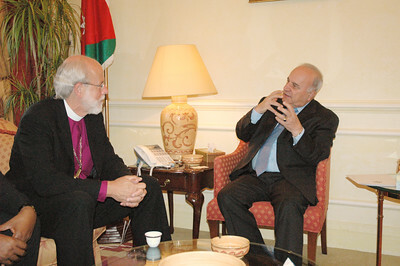 Bishop Mark Hanson, ELCA presiding bishop and Lutheran World Federation (LWF) president, left, met with Jordan's Prime Minister Adnan Badran Aug. 28 in Amman. Badran told Hanson and other LWF leaders of Jordan's need to educate its children to respect differences in ideologies, religions and cultures. 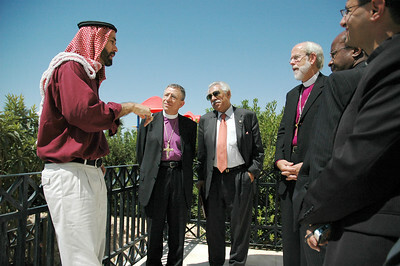 Hanson and other LWF leaders visited Jordan prior to the start of the Aug. 31-Sept. 6 LWF Council meeting in Bethlehem. His Royal Highness Prince Ghazi, personal envoy and special advisor to Jordan's King Abdullah, hosted leaders of the Lutheran World Federation (LWF) Aug. 28 at his home in Amman. With the prince are, from left, Bishop Munib Younan, Evangelical Lutheran Church in Jordan and the Holy Land and LWF vice president; Akel Biltaji, advisor to His Majesty the King, and Bishop Mark Hanson, ELCA presiding bishop and LWF president. 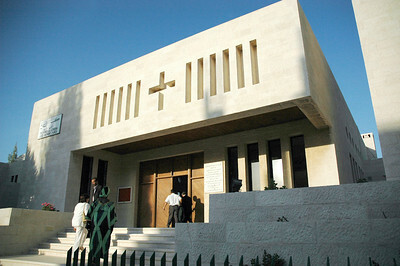 Good Shepherd Lutheran Church, Amman, Jordan, is the only Lutheran congregation in Jordan affiliated with the Evangelical Lutheran Church in Jordan and the Holy Land. Bishop Mark Hanson, ELCA presiding bishop and Lutheran World Federation (LWF) president, preached at a worship service here Aug. 28. 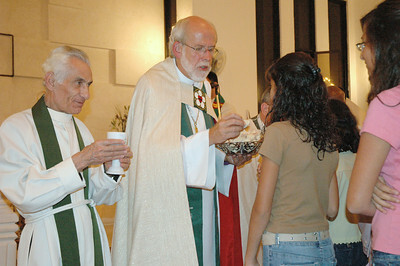 Bishop Mark Hanson, ELCA presiding bishop and Lutheran World Federation (LWF) president, center, serves communion at a worship service Aug. 28 at Good Shepherd Lutheran Church, Amman, Jordan. Assisting Hanson is, left, Rev. Numan Smir, founder and former pastor of Good Shepherd. Bishop Mark Hanson, ELCA presiding bishop and Lutheran World Federation (LWF) president, right, listen to a tour guide at a recently excavated site which is said to be the baptismal site of Jesus. The site is located on the east side of the Jordan River. Hanson and LWF leaders visited the site Aug. 30, as they traveled into Israel by car following a visit to Jordan. The leaders were on their way to the LWF Council meeting Aug. 31-Sept. 6 in Bethlehem. 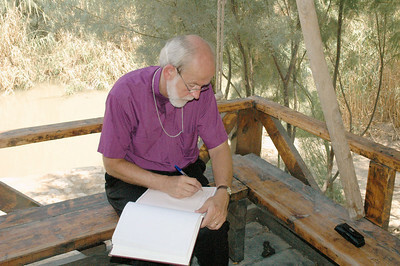 Mark Hanson, ELCA presiding bishop and Lutheran World Federation (LWF) president, signs a guestbook at a recently excavated site which is said to be the baptismal site of Jesus. The site is located on the east side of the Jordan River at a recently excavated site which is said to be the baptismal site of Jesus. 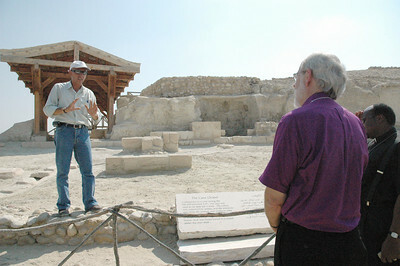 Hanson visited the site Aug. 29 on his way to the LWF Council meeting Aug. 31-Sept. 6 in Bethlehem.